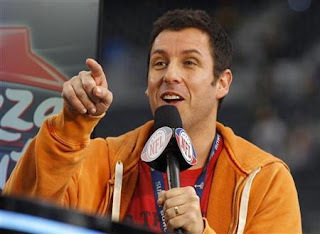 The Golden Raspberry Foundation said the cross-dressing comedy, in which Sandler played both the male and female lead parts, was the first film in the 32-year history of the Razzies to sweep all 10 dishonorable categories. Oscar-winning actor Al Pacino also was declared a winner in the contest that was created as an antidote to the love-fest that engulfs Hollywood around awards season that ends with the Oscars in late February. This year, the awards were handed out on April Fool's Day in a change of tradition that for years saw the Razzies announced on the eve of the Oscars. Pacino, who played himself in a cameo appearance in "Jack and Jill", was named worst supporting actor, and he also received a mention in the worst screen couple category along with co-star Katie Holmes. Sandler, 45, was voted worst actor and worst actress, and shared the award for worst screen ensemble. "Jack and Jill", which he also helped to write, was voted worst picture, worst re-make, worst director and worst screenplay. The winners were determined by some 650 members of the Golden Raspberry Foundation, and more than 35,000 ballots on movie review website Rotten Tomatoes. Organizers said the cast of "Jack and Jill" was only just ahead of box-office hit "The Twilight Saga: Breaking Dawn - Part 1" in the voting.